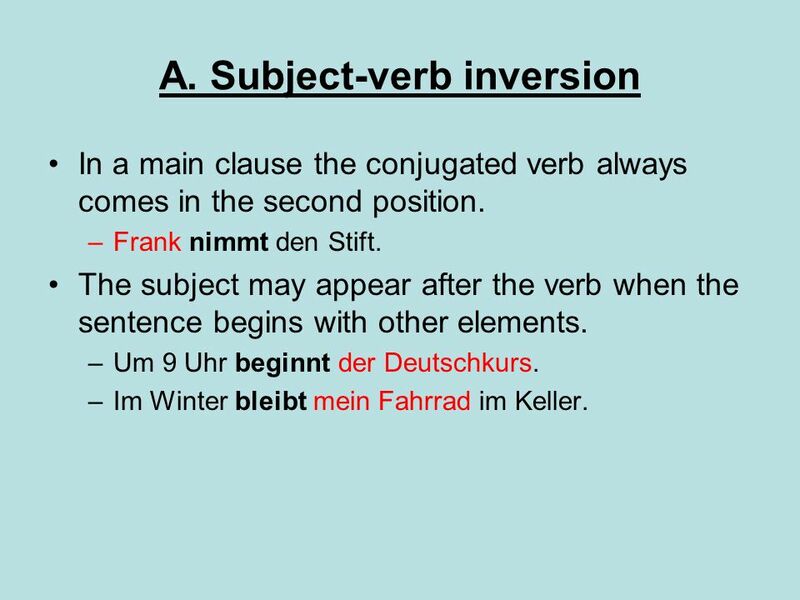 In a main clause the conjugated verb always comes in the second position. Frank nimmt den Stift. The subject may appear after the verb when the sentence begins with other elements. Um 9 Uhr beginnt der Deutschkurs. Im Winter bleibt mein Fahrrad im Keller. 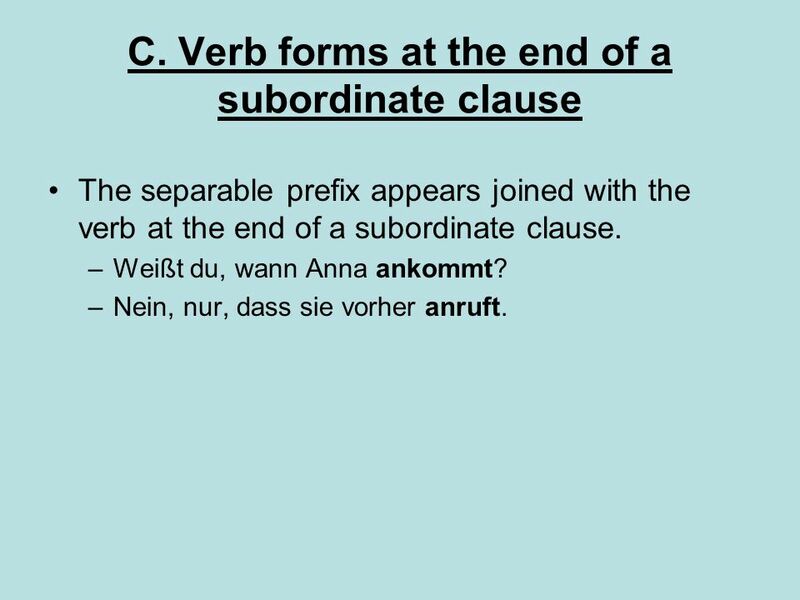 Some verb forms occur at the end of the main clause: a) Modal verbs: infinitives placed at the end of the main clause. Martin soll sein Zimmer aufräumen. 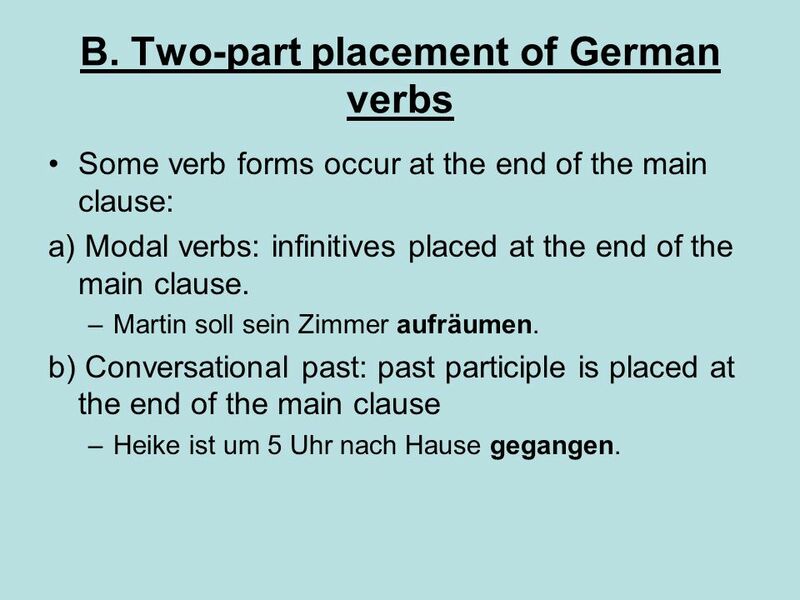 b) Conversational past: past participle is placed at the end of the main clause Heike ist um 5 Uhr nach Hause gegangen. 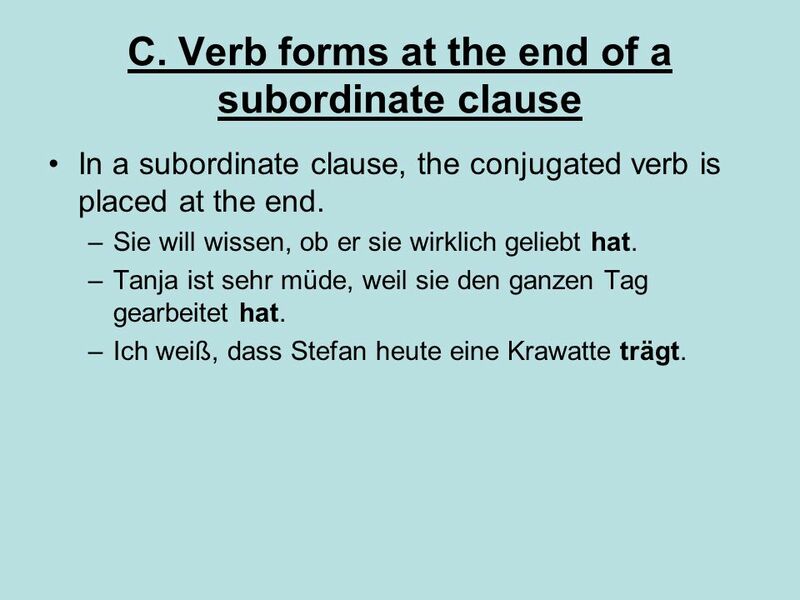 In a subordinate clause, the conjugated verb is placed at the end. Sie will wissen, ob er sie wirklich geliebt hat. Tanja ist sehr müde, weil sie den ganzen Tag gearbeitet hat. Ich weiß, dass Stefan heute eine Krawatte trägt. 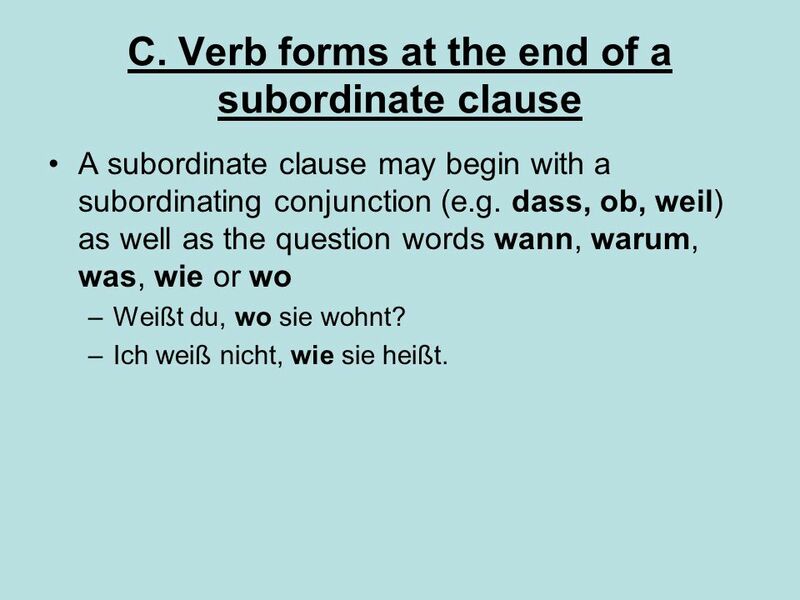 A subordinate clause may begin with a subordinating conjunction (e.g. dass, ob, weil) as well as the question words wann, warum, was, wie or wo Weißt du, wo sie wohnt? Ich weiß nicht, wie sie heißt. The separable prefix appears joined with the verb at the end of a subordinate clause. Weißt du, wann Anna ankommt? Nein, nur, dass sie vorher anruft. 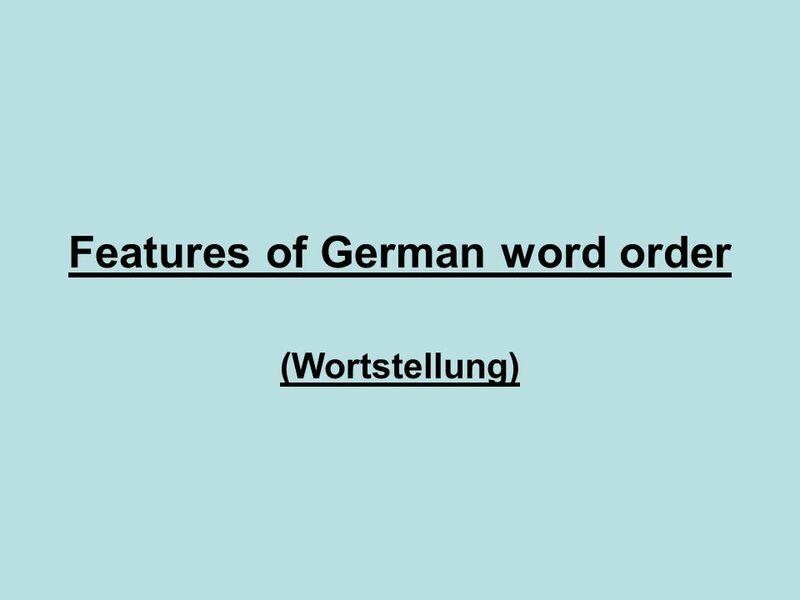 Herunterladen ppt "Features of German word order"
Todays Learning Objective: To apply modal verbs to say what the rules are at home! Todays Language Focus: Ich muß = I must Ich darf = Im allowed to Ich. Writing in German How to be a successful writer of the German language. Was hast du gemacht (using sein verbs). is easy as H M Boddy I you (singular) she /it it du er ich he/it sie es. Sentence Structure. A basic sentence. Subject Subject + verb + the rest of the sentence.